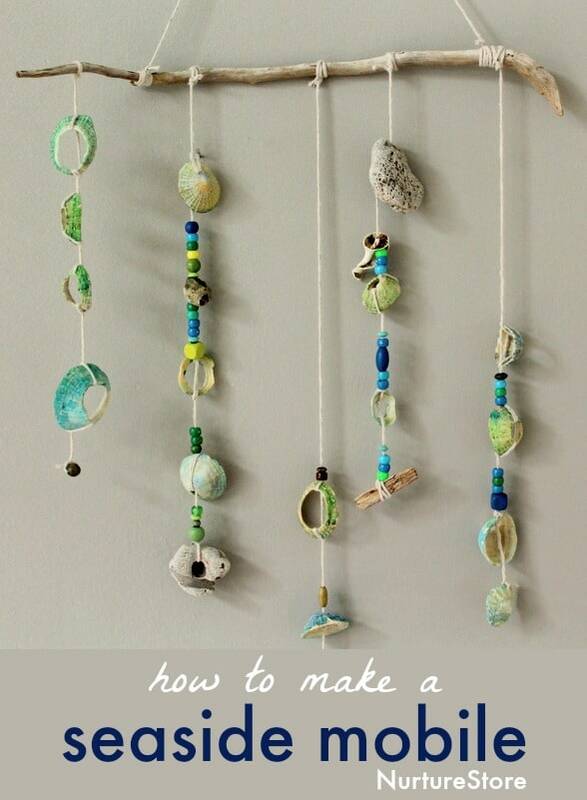 Such a pretty seaside craft for kids, and a lovely memento of a beach holiday: here’s how to make a shell mobile. >>> Click here to see our favourite children’s books about the sea, with activities to match! 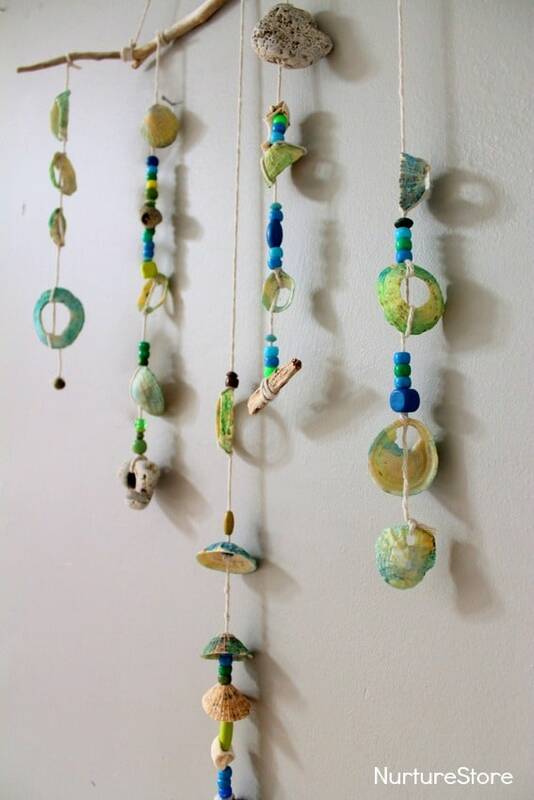 This mobile is a beautiful way to use all those shells gathered at the beach, and makes such a pretty souvenir of a holiday. And all that threading is a great workout for fine motor skills. To make one, we used all the pebbles and shells we gathered at the beach that naturally had holes in them. Thank you nature for making them perfect for threading! We also used some drift wood, as the frame from which we hung the strands of our mobile, and also as some extra decorations. 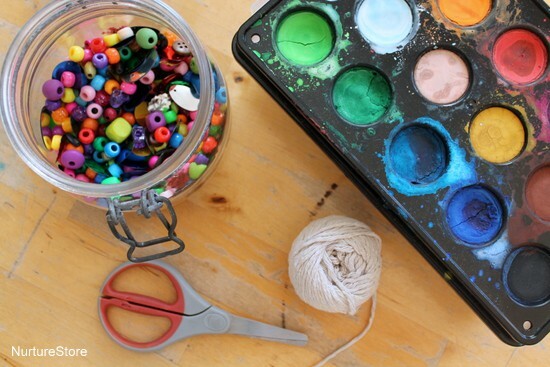 We used plain twine to thread everything together, and watercolour paints and beads to add some extra colour and interest. 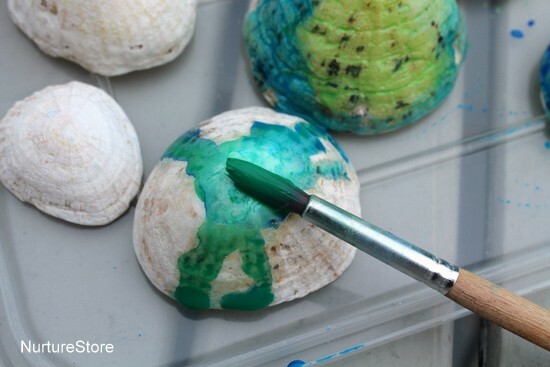 We painted our shells with the water colours, using marine colours of blue and green. The mobile is very easy to make. We began by tying our twine around one item from our collection, to start each thread of the mobile. The pebbles give a good weight to the end of the line, and we also used a shell and a bead on some of the other strands. You can combine the shells, beads and pebbles in any pattern you like. 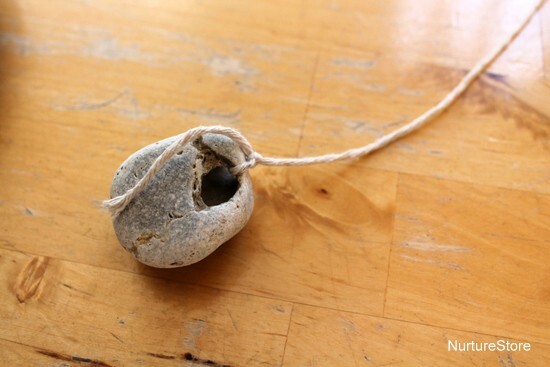 The twine can be wrapped around opposite sides of the shells to hold them in place and space them out. To hang the seaside mobile we used a piece of our driftwood, and tied on the twine to make a handle. Think about how you will combine the heavier pebbles with the lighter shells and beads. You’ll need a main piece of wood that is strong enough to hold the weight of all the strands you are making, but still create a mobile that’s light enough to hang on the wall or ceiling easily. 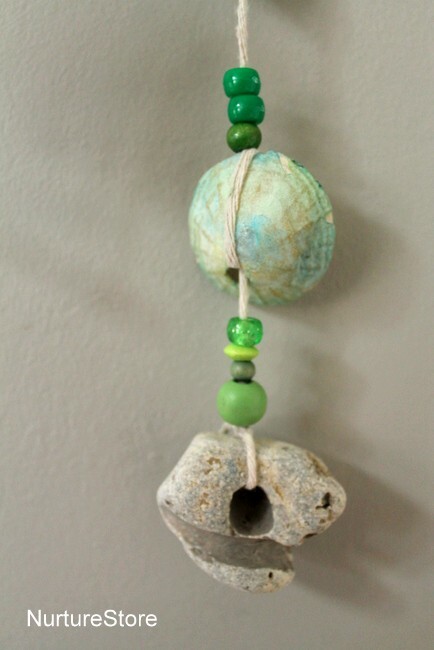 You can experiment with different patterns, using beads to space the pebbles and shells. Try different combinations and see which you like best. Once you have threaded several strands, you need to tie them on to your main branch of drift wood. You’ll need to balance the mobile, so it displays the threads without tipping over to one side. 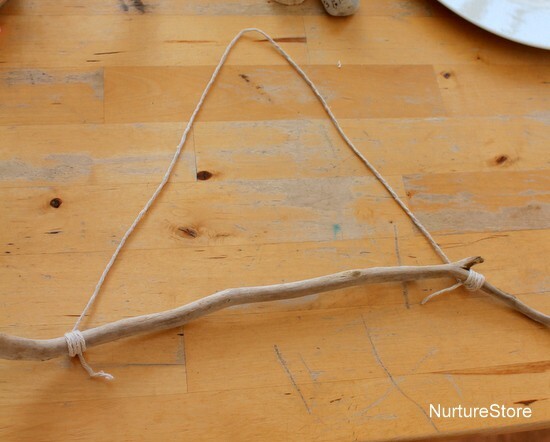 The easiest way to do this is to hang up the drift wood branch and loosely tie on the strands, so you can easily adjust them until you are happy with your display. You can move them more into the centre, or to the outside, and lengthen or shorten the hanging twines until you get the look and balance you want. Then tie each strand in place securely. 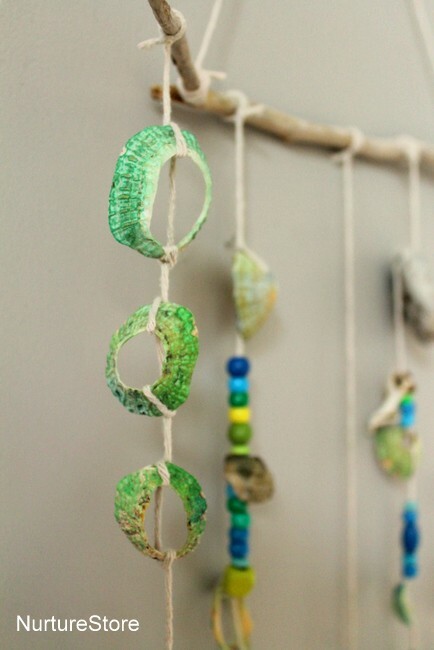 If you have lots of shells there are many ways you can use them. 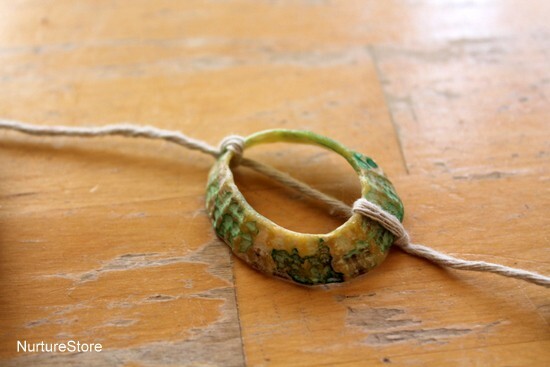 Have you ever made shell mandalas? 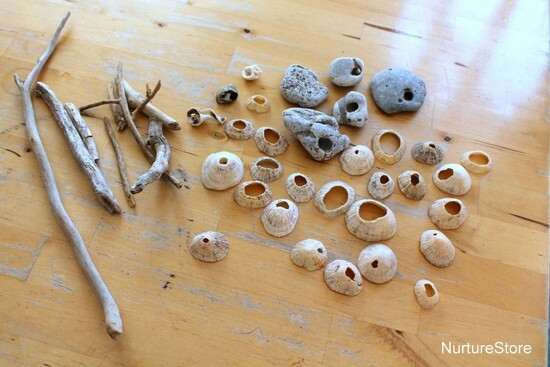 Shells combine wonderfully with play dough. Try this homemade lemon play dough recipe. They make lovely holiday fairy houses! And for some multi-sensory learning you can use them to learn sight words. Hey, are you doing a project on fish, the seaside or the ocean? If you’re looking at this article then I guess you might be. 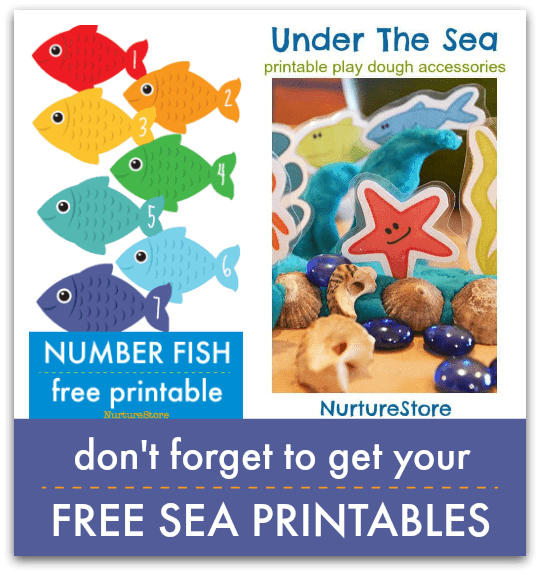 I have some great free printables on a fish theme that I think you’ll love.